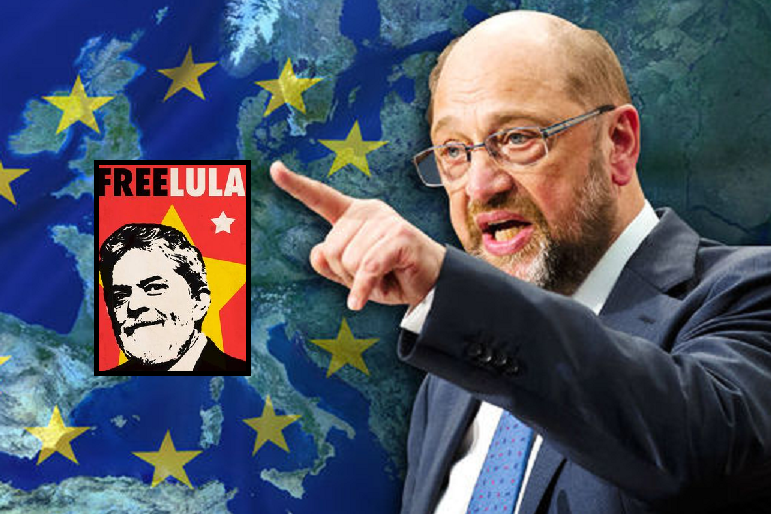 One day after the leftwing Guardian newspaper put all the blame for Brazil’s current economic woes squarely with current President Temer (see our related coverage), the former leader of the German socialist party and the former head of the socialist party in the EU Parliament, the very powerful EU politician Mr Martin Schulz, made a controversial visit to former President Lula Da Silva in prison, a move seen by many in the European press as interfering in Brazilian politics. Related coverage: <a href="https://thegoldwater.com/news/35645-Brazil-Election-Left-Wing-The-Guardian-Criticizes-Temer-Preparing-PT-Return"> Brazil Election – Left-Wing ‘The Guardian’ Criticizes Temer – Preparing PT Return? </a>. Mr Schulz was asked the question upon his arrival immediately. He answered: "No power in the world can prevent me from telling a man who I have known for many years and who I trust: I believe you. I encountered a very brave and fierce man today." According to popular German opinion, the current incumbent Mr Michel Temer leads a "criminal organization"; his predecessor Dilma Rousseff was impeached in 2016; and the most popular politician, Mr Lula da Silva, is serving a 12-year jail sentence for corruption. Mr Schulz claims there is nothing peculiar about his visit, saying it was planned long ago. He also stated that Brazil’s election is of "global importance." Related coverage: <a href="http://thegoldwater.com/news/35180-Brazil-Facebook-Continues-To-Censor-Bolsonaro-Supporters"> Related coverage: Brazil – Facebook Continues To Censor Bolsonaro Supporters</a>. It is widely expected that Brazil's electoral commission will throw out Lula's candidacy on the grounds that the law does not allow people with criminal records to run for president. The decision has to be announced by September 17 at the latest. Lula is a criminal. Plain and simple. He’s a proven crook who stole millions from our country while pretending to work “for the people”. He threw us into the mess we are now. He deserves to rot in jail for life.